For many of us, hoarding is all-too-easy a habit of falling into. Whether you find it hard letting go of stuff for sentimental reasons, or you merely struggle to work out what you don’t need, allowing materials to accumulate and take up space is a common problem. We often tend to think of this as merely a habit that leaves the place looking cluttered and untidy. But hoarding can be more dangerous than you might think. Here are some consequences you may not have considered before. It’s challenging to keep surfaces clean if you can’t see them, after all! Hoarding not only lets germs cultivate, but it also offers an excellent breeding ground for annoying, disease-carrying rodents and insects such as mice, rats and cockroaches. Before long you’ll start seeing faeces lying around in unwelcome areas and may not be able to fight back against the infestation. In fact, your hoarding is helping them out, providing an environment in which they can flourish. If left untouched, it will only continue to encourage them and may attract even more to join the growing community of pests. The consequence of this is obviously an unpleasant living/ working environment, but more importantly, a risk of infection to those in the immediate vicinity, including children and pets. 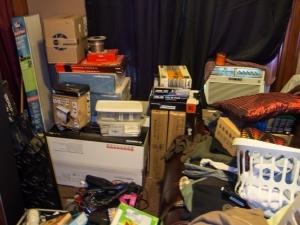 In some cases, excessive hoarding is already the result of an anxiety disorder. For everyone else, perhaps laziness is a factor. Either way, hoarding in the long term will negatively affect mental health as it takes its toll. Consequences may be seen in guests no longer wanting to visit and the resulting loneliness of losing contact with friends, or a general loss of confidence in other areas of life associated with not keeping your environment tidy. The appearance of rodents, mentioned above, will also serve to heighten anxiety, especially if you don’t feel able to solve the problem or are caring for others who depend on you. Even if hoarding does not adversely affect your mental health in distinct ways, it will affect the peace of mind, if not in yourself then in those around you. In the workplace especially, people will find it harder to concentrate and think creatively when their environment is overly cluttered. It has been said that a cluttered environment reflects and encourages a cluttered mind; there is some evidence to support this. If you’re partially or fully responsible for an office space, or regularly work from home, this is certainly something to bear in mind. This is important to consider in a professional capacity as well as a personal one. People are going to end up judging you in some way for the space you keep, even if they don’t show it externally. It may affect whether they want to do business with you. This could in turn negatively impact your overall career and lead to a loss of income. All of which may sound overly dramatic, but it’s one of the unseen long-term effects of hoarding – especially in an office environment – that needs to be considered. As you can see, the impacts of hoarding can be as dangerous psychologically as they are physical. It also affects the public image we portray to those around us. If hoarding is an issue for you, it can’t afford to simply be ignored as if it won’t have a potentially dangerous outcome. The good news is, hoarding isn’t an irreversible problem. On a larger scale, though, your only option is likely to call in a professional team to help sort it out for you. Otherwise, there are smaller actions you can take to tackle the issue of hoarding. The team at 1300Rubbish are experienced rubbish removalists, dedicated to helping you or a loved one out of this situation. Get your free quote here. First, be as honest as possible with yourself about what is causing your hoarding. Maybe ask friends or family if they can help identify what factors have cultivated it and whether they can help control it going forward. It’s then about the little steps. Taking each day as it comes, keep a record of what is considered essential, and what could otherwise be disposed of. Remember that getting rid of everything in one go doesn’t necessarily solve your hoarding. If it’s a habitual problem, it will only keep happening until you confront the core issue. By confronting it every day, you can prevent your hoarding becoming an insurmountable recurring problem that will only continue causing stress for you and those around you.